Stay tuned! This blog has been dormant for a couple years but I am excited to announce that it will be brought back to life and made even better! The yummy, healthy recipes will remain (and hopefully increase) but new topics will be added on fitness, family, faith and financial tips. The goal for this blog is to help YOU balance life without falling apart – living a WHOLE life in all its craziness. Who doesn’t get overwhelmed trying to balance all the important aspects of life? Do I eat healthy enough, work-out enough, love my kids enough, give quality time to my husband enough, save enough? Am I ENOUGH? Yes, you are! You can balance all these things as long as you approach life with the right perspective. Join me as we do LIFE together. See you soon! 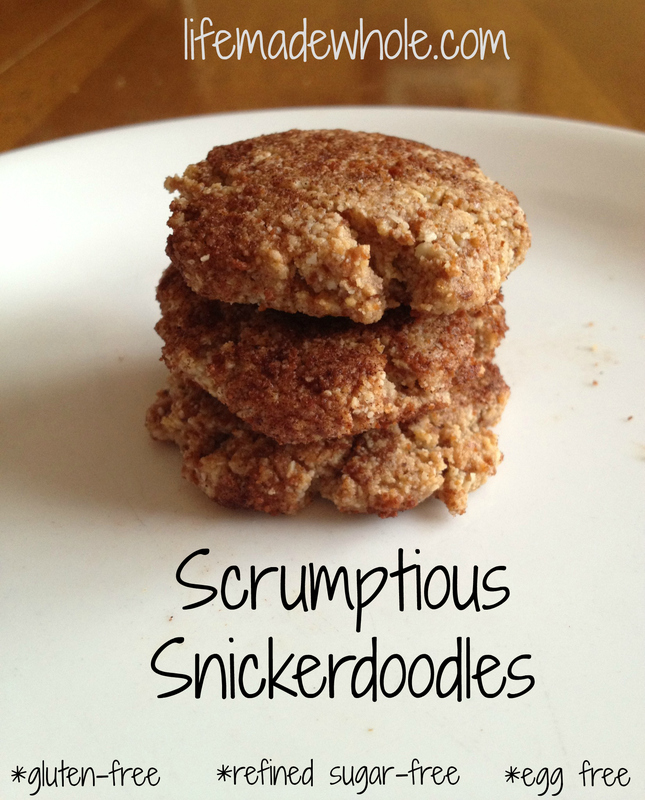 There are few better things than finding an easy, healthy, kid-friendly cookie recipe. In a quest to cut out gluten in my diet (as much as possible) and to provide refined sugar-free treats for my kids, I stumbled upon a great recipe from The Urban Poser. I had purchased some almond meal from Trader Joe’s and I was determined to make something awesome with it. I had already tried muffins and I wasn’t over-impressed so I was ready to try something new. So when I found a cookie recipe that was made with almond flour, coconut oil and was sweetened with honey, I was smitten. One thing to consider about this recipe is that the Urban Poser used almond flour – she recommends a finely ground flour by Honeyville. I did not have that, I had almond meal which is very similar, just not ground as fine as flour. I suppose I could have put in in my Vitamix and ground it finer, but I like to keep things simple and wanted to try it with exactly the ingredients I had. Almond meal at Trader Joe’s is a great deal at only $3.99/lb so I am remiss to begin purchasing more expensive ingredients from online retailers such as Honeyville. I am just not that picky. Preheat the oven to 350 degrees and prep your cookie sheet. Combine dry ingredients and mix well. Create a well and pour in the coconut oil, honey and vanilla. Mix well until combined. (The dough will be thick which is OK because of the next step….) Scoop out about a tablespoon of dough and form into a ball (or something close to it!) and roll it into the cinnamon coating mixture. Place the ball of coated dough on the cookie sheet. Using the bottom of any container (I used a mason jar but you could use the bottom of a measuring cup, mug, etc.) and gently flatten each cookie. Repeat. Bake in the oven for about 8-9 minutes. Leave the cookies on the sheet while cooling. The cookies will be slightly soft coming out of the oven but will firm up as they cool. If you prefer a crispier cookie, keep them in a minute or two longer. 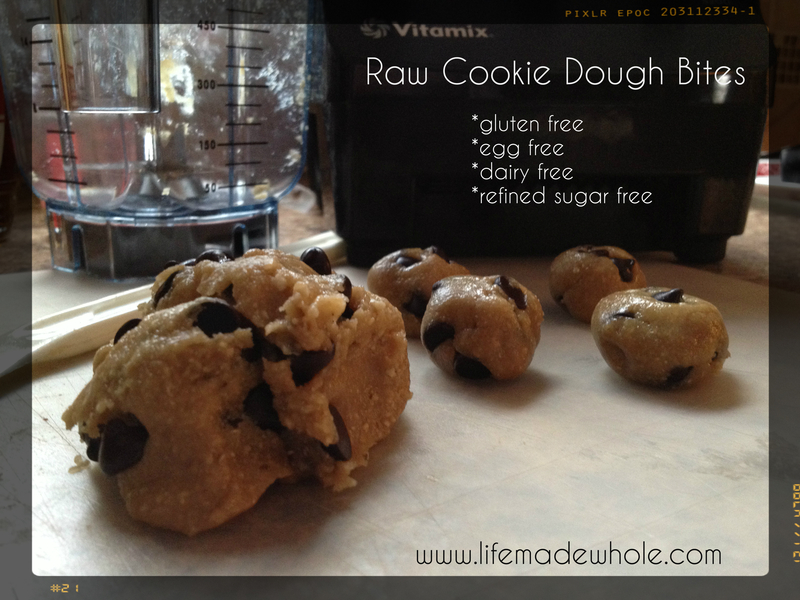 This has to be one of the easiest, tastiest, healthiest, most awesome treats I have made yet. I am so excited to share it with you because it will satisfy just about any craving you have that you thought couldn’t be satisfied since switching to a whole foods diet. I know it seems, especially in the beginning, that there are a lot of “I can’t haves” – and there are. However, the best thing to do when phasing the bad foods out, is to phase good foods in that are equally or even more satisfying. This is challenging. I have been eating a “real” food diet for about 18 months and I am still seeking new ways to please my own sweet tooth, my husband’s and my children’s without introducing refined sugars back into our diet. Now, to be totally transparent with you, the chocolate chips do contain evaporated cane juice which is more refined than I would prefer but they contain a very low sugar count (only 5 grams per tablespoon) and contain a high quality cacao. If you would prefer to not include chocolate chips, you could fold in raisins, chopped dates or walnuts. One other note, I made this in my VitaMix – in the dry goods container which I believe made it super simple. According to the original creator of this recipe, it can be done in a food processor. I cannot vouch for that, so if you use one, please comment and let me know how it works out. I am so glad I stumbled upon this recipe and was also so pleased that my slight modifications made it perfect! The original recipe called for agave. I do not use agave, it is highly refined and high in fructose. I subbed for all maple syrup and added a dash of salt. I hope you enjoy these! They did NOT last long in my house. The recipe yields about fifteen 1/2″ in diameter balls. I stored them in the freezer but I believe they would be fine in the fridge as well. In the Vita-Mix dry goods container, add the cashews and oats and blend till they become a flour-like consistency. Then add in the maple syrup, vanilla and salt. Turn the Vita-Mix on low and it will quickly blend and “ball up” on top of the blade. Once it balls up (in literally seconds,) turn of the machine and dump the ball of dough on a cutting board. Dump the chocolate chips on top and work them into the dough with a spatula. Take small amounts of the dough and roll it into 1/2 inch balls. If the dough is too sticky, place it in the fridge for a half hour and then roll it into balls. I was able to make the balls right away. Store the balls, or “bites” in the freezer or refrigerator. Avocados, oh how I love thee. I have been somewhat enamored with this fruit…yes, it is a fruit…for just a short while as I was just introduced to this wonderful piece of deliciousness in the past year or so. 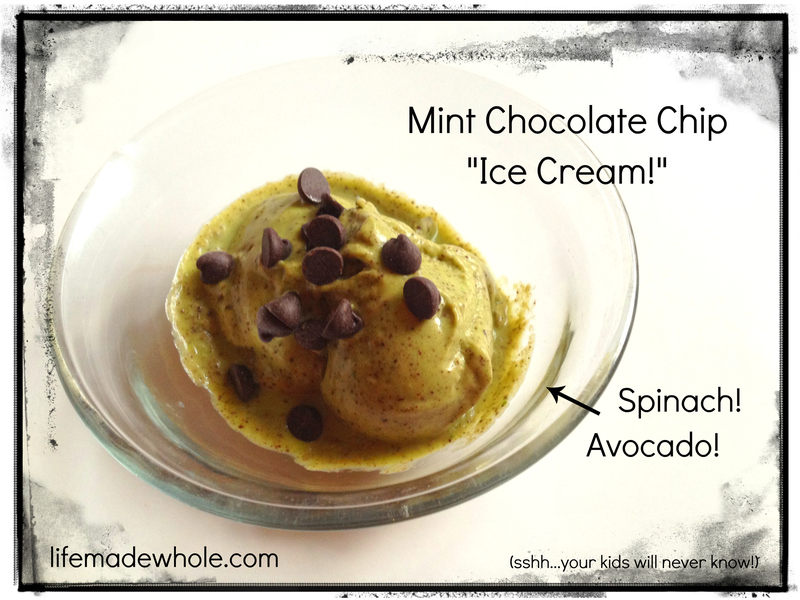 It is so healthy, so creamy, and so versatile. It can be added to smoothies, made into puddings, into “ice cream,” and into guacamole (the most obvious choice, right?) I have made guacamole with packets of seasonings but I don’t like all the additives and I have purchased guacamole from Whole Foods and Trader Joe’s but it gets downright expensive! I can buy organic avocados at Trader Joe’s for as little as 99 cents each on a good day! 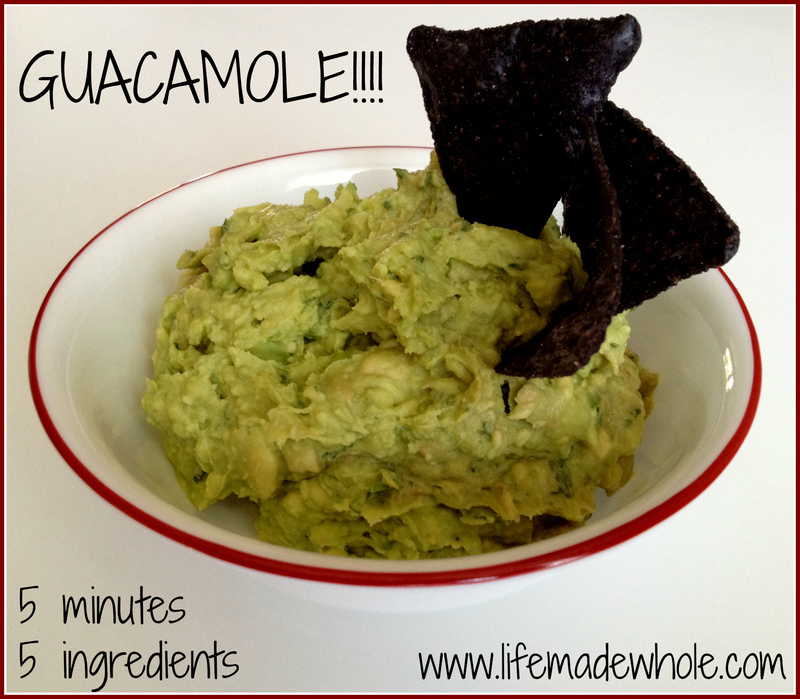 A local Whole Foods had a “guac-off” recently – pitting several types of guacamole against each other and I fell in love with the one they called “spicy vegan guacamole.” I picked up the recipe and have been making it myself at home ever since. I believe this recipe is fully customizable based on preference – if you like hot – add more jalapeno, if you like cilantro – add more, if you don’t – add less. The recipe below is my preference and isn’t exactly the Whole Foods version. Also, I adjust the recipe each time I make it because I don’t always have 4 avocados so I need to scale down the rest of the ingredients. Make it your own! Combine all the ingredients and mix well. Guacamole tastes best when given time to “meld.” I like to make it several hours and refrigerate it before I want to eat it. This is not necessary, just personal preference. Warm up the milk on the stove (NOT THE MICROWAVE!) and stir in the cocoa and maple syrup with a small wisk. The wisk is a great tool for this. It really helps stir in the cocoa. Be careful not to burn the milk. Serve and Enjoy! I can hardly believe it myself. If it weren’t for a Vitamix demo at a local Whole Foods Market, I would not have believed it — or even tried the recipe. To me, it would have been way too “out there.” When the demonstrator was loading the ingredients into the high-powered blender, I was shaking my head in disbelief. Let’s back up a bit. I have had a bit of an obsession. I have had something on my “wish list” for many months. It was this crazy powerful blender (if you can call it that.) A VITAMIX! Now, I am not trying to sell you anything (I won’t even link up to a page that would earn me commission because that is not my goal.) I am telling you this because my husband was a skeptic. What could this blender do that our already “not-cheapo” blender by Breville couldn’t do? Why should a blender cost 500.00? I didn’t really have a good answer for him except that it could blend smoothies with fruit with the skins on and the seeds still in tact. I, myself, didn’t even really grasp the capabilities of the machine. However, I was going to have to convince my husband that this was a wise purchase. Being on the “Dave Ramsey” plan and aiming to be debt-free within the next 6-8 months, I really shouldn’t be spending a small fortune on a counter-top appliance, right? I suppose. If I were hard-core Ramsey, I would be throwing every extra penny at my debt, however we had the cash available and I really, really, really, really wanted one. If my husband would have said, “NO WAY,” I would not have argued (too much) and we would have thrown the money at the debt. But…I needed to give it shot. I found a live demonstration at a local Whole Foods (well, if you consider an hour’s drive local) to show him what all the fuss was about. We stood there about 45 minutes, letting the demonstrator feed us smoothies, soups, fancy coffee drinks and lastly the mint chocolate chip “ice cream” with crazy healthy ingredients. The “ice cream” was the kicker for me. I chose my machine, got my complimentary Whole Foods reusable grocery bag and went to the check-out. Now, due to my wish being granted, you get to benefit from all the new awesomely healthy recipes that I have tried and will try! This recipe can be found at SmoothieSisters.com and I did not alter it except that if the mixture got too thick, I splashed in some raw milk. Add ingredients to the blender in the order listed. Blend until smooth. If you have Vitamix, you will need to tamp it down while it is blending. If you don’t have a Vitamix, you may need to stop the blender a couple times to mix it up and restart. Be patient, it takes a while to blend. Throw the chocolate chips in near the end otherwise they will be too blended. I also toss a few more on top after it is served. It is best consumed immediately and with a smile. If you find that it is too thick and not blending well (if you add too much ice, etc.) feel free to toss in a splash of milk (I use raw) or coconut milk. I have had to do this a few times and it helps it blend when I accidentally add too much ice or if I cut back on the sweetener. This is simply amazing. Amazing because it is so yummy yet so healthy and so simple to make. It is so refreshing that I can’t wait to get more strawberries so I can make more! It is strawberry picking time where I live. so this is THE perfect recipe for right now. However, I can’t take full credit for this recipe – I have to give credit to Whole Foods. This was one of their wonderful samples that was being offered at my most recent shopping trip. 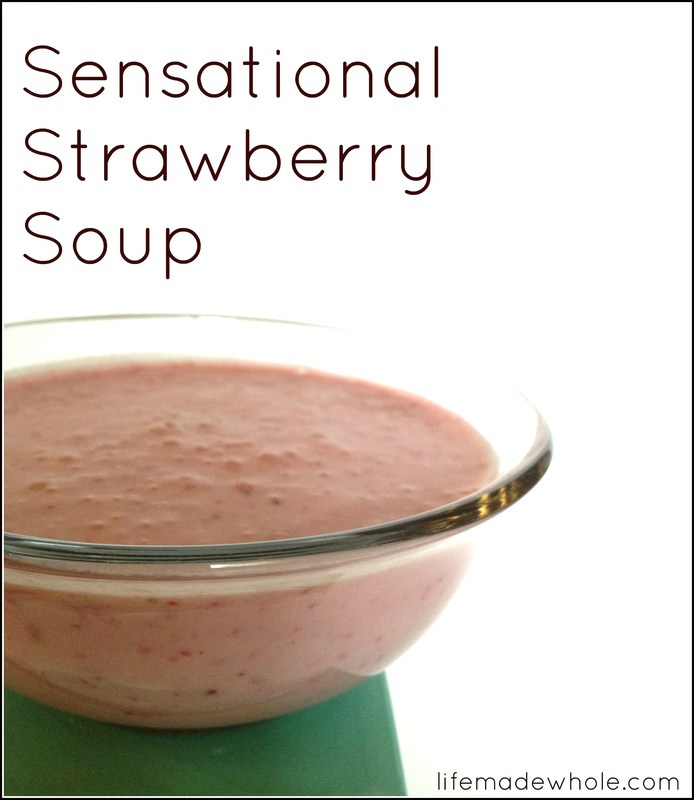 I was greeted as I walked in the front door with a small cup of this strawberry soup. I took a sip and I was in love. Then I got nervous — thinking, “there is no way this is good for me, I surely will be able to find some ingredient that I will be disappointed in.” I grabbed one of the recipe cards they provided and was pleasantly surprised to not see ONE thing that I disliked. I immediately said to my mom, who was with me, “I got to blog this recipe!” I bought the ingredients and made my own batch the next day and was so happy that it turned out just as tasty — actually tastier because I omitted the suggested salt & pepper. I am so happy to share it with you! This soup contains coconut milk as the base. Coconut milk can be found at any grocery store, often with Thai food or in the organic section. I bought a can of Whole Food’s brand organic coconut milk. Coconut milk is CHOCK FULL of health benefits. Coconut milk is dairy free yet high in calcium. Half the medium-chain fatty acids in coconut milk are composed of lauric acid, which is anti-viral, anti-microbial and anti-fungal thus strengthening the immune system. Coconut milk is anti-bacterial which aids in digestion because it kills off the bad bacteria in the stomach. Also, the saturated fat in coconut milk is made up of short chain medium fatty acids which the body doesn’t store as fat but converts to energy which aids in weight loss. All all ingredients to a blender and blend until smooth. Store in the refrigerator. This is best served cold. Add some fresh strawberries, blueberries or raspberries and dollop with some fresh made whipped cream for a delightful dessert!